Tiger Lily recovering from declaw repair surgery after 10 years of pain. Tiger Lily finally finds relief after suffering for 10 years from a declaw operation, illegally performed on her in California. 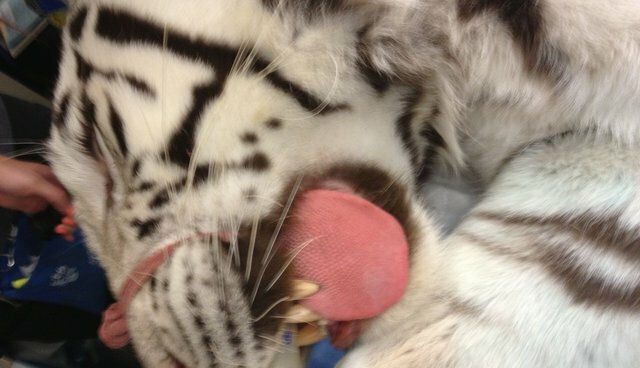 Lily was declawed by her veterinarian and had immediate pain and complications. Declawing is the amputation of a cat's last bones in the paw. It is considered mutilation in much of the world. The Paw Project went to work to repair Lily's paw by reattaching her severed tendons so that she would have function in foot. After 5 long hours of surgery she awoke to a pink bandage on her previously crippled paw. Within days she began to use her left front limb and a few days after that, her limp was barely noticeable. Now Lily lives pain free. She is scheduled to have her other paws fixed in the months to come.